Will today be your lucky day? 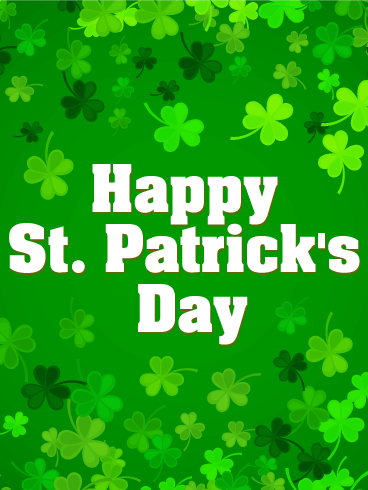 On St. Patrick's Day, it's always your lucky day! 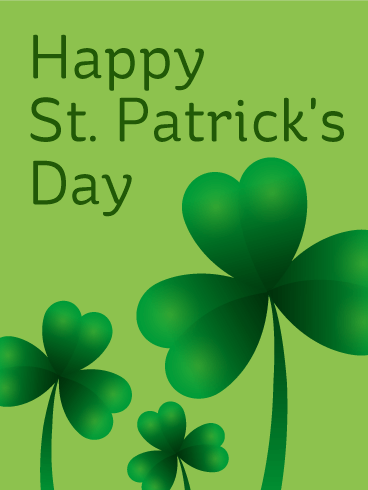 As this fun holiday approaches, use this green, fun Happy St. Patrick's Day card to celebrate the luck of the Irish! 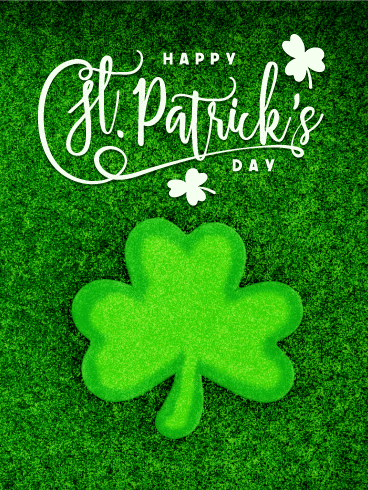 The lucky clovers and green colors are the perfect way to start your St. Patrick's Day celebration, so send this card to bring luck to your loved ones today! Raise a pint and make a toast! Green beers all around today! We all have a bit of the mischievous leprechaun in us on St. Paddy's Day and it's great to join the fun whether you're Irish or not! 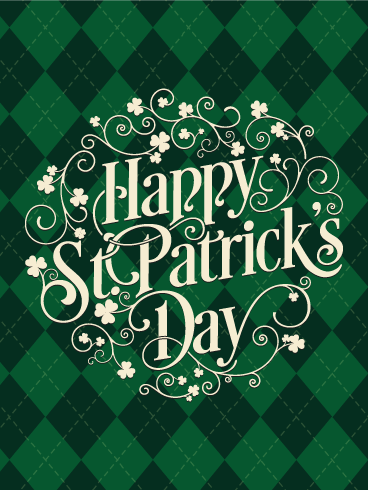 So send this festive St. Patrick's Day card to all your friends and then go out and join them for a day of dancing and drinking and all-around merrymaking. Nothing says Irish like argyle. Send this classic St. Patrick's Day greeting card to friends and family. The message is written in an old and elegant font with lucky clover all around. It's a great way to get the festivities started and celebrate St. Patrick's Day with all the vim and vigor it deserves. Let the merry-making begin and send this Happy St. Patrick's Day card today. The luck of the Irish be with you! It's St. Patrick's Day again and we have the brightest and luckiest cards of all! 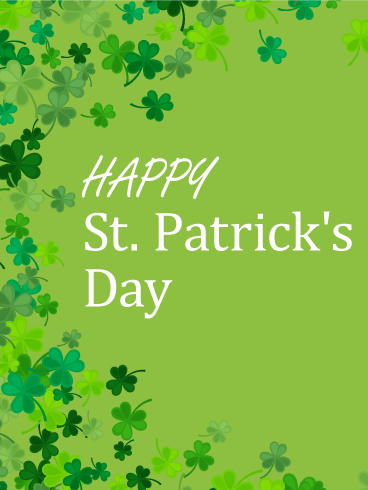 Send a St. Patrick's Day greeting card to your friends and family to celebrate one of the most fun holidays. Today, everyone is Irish. Look for a leprechaun, search for a four-leaf clover, and keep your eyes open for rainbows. 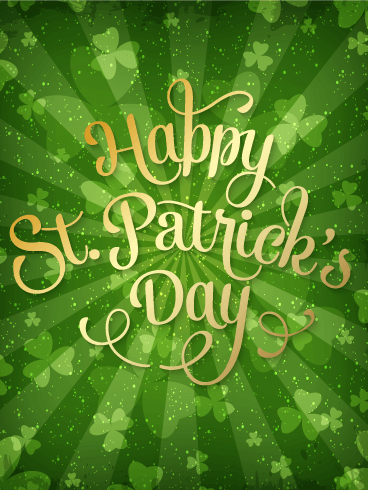 Wish a Happy St. Patrick's Day while reminding your friends to put some green on to celebrate the day in style. It's an explosion of four-leaf clovers! 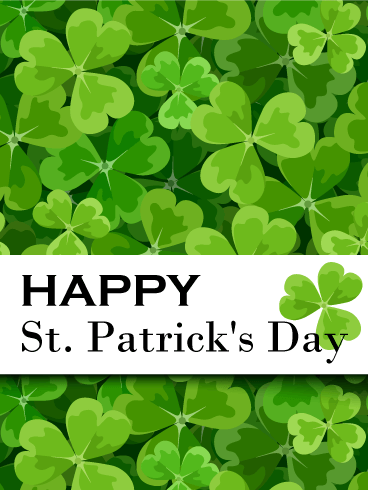 Share some luck of the Irish when you send this St. Patrick's Day greeting card. This green and sparkly St. Patrick's Day card will make everyone want to do a jig and down a pint of Guinness! So what are you waiting for? Send this festive St. Patrick's Day and watch the smiles grow. On St. Patrick's Day everyone is Irish! Share the Irish spirit and just a bit of the Irish luck with this fantastic St. Patrick's Day card. 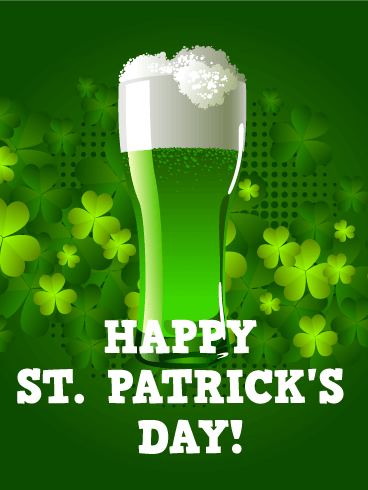 There will be parades and kissing, dancing and drinking, and lots and lots of green today. Spread the fun and join the festivities when you send this green and clover-filled St. Patrick's day greeting card. 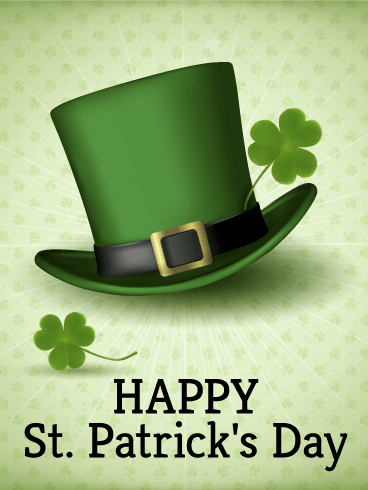 A little leprechaun told me you should send this St. Patrick's Day card! Don't hesitate a minute! Join the fun of St. Patrick's Day and send some lucky clover to your friends and family. This is a nice and cheerful St. Patrick's Day greeting card that is great for anyone and will spread the Irish spirit and joy on this heel-kicking and pint-drinking day. May the luck of the Irish be with you! Send this St. Patrick's Day greeting card and you'll be sure to find the pot o' gold at the end of the rainbow. This delightful St. Patrick's Day card deliciously green and wonderfully lucky. An elegant and simple way to wish all your friends and family a Happy St. Patrick's Day (and remind them to wear some green or get a pinch!). Have you thought up the perfect Irish toast for St. Paddy's Day yet? Well, if not then just send this lucky clover card and you'll be set! Spread some Irish cheer and the festive spirit to all your friends and family when you send them this lean, mean, and green St. Patrick's Day greeting card. Kick your heels together and do a jig and share a pint or a kiss-St. Paddy's Day is a day of fun and good cheer for everyone! 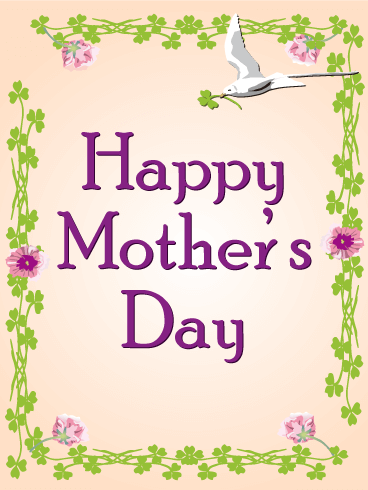 Give Mom the gift of luck, love, and peace this Mother's Day when you give her this charming Mother's Day card. Lucky shamrocks interlaced with perfect pansies beautifully frame your Mother's Day message, while a peaceful dove brings her a gift of love…and a shamrock for a little bit of extra luck!